The WASH House Inc. is a community based resource centre for women. It is a place of support, information and a step to other services. 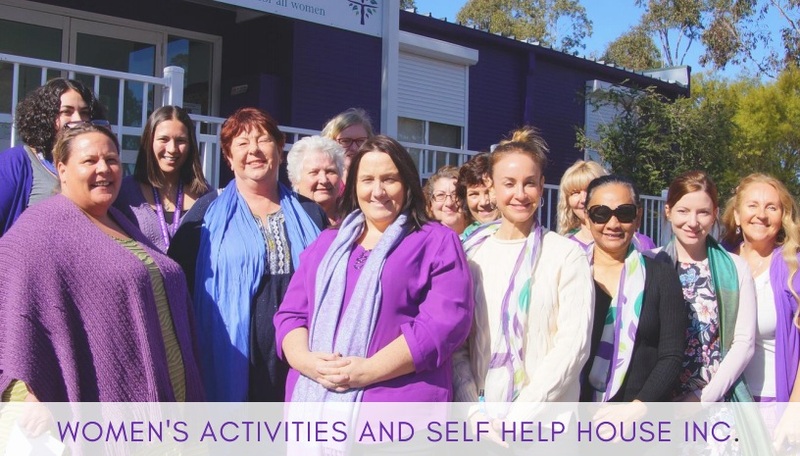 We offer a range of services and activities for women in the Blacktown LGA and surrounds. The aim of the WASH House is to reduce the impact of poverty, social disadvantage and violence on the lives of women and their families. We do this through the provision of women-centred, quality, timely, culturally sensitive and accessible services. Jo Fuller graduated as a social worker in 1981 and completed a Master of Social Work in 1999. She worked as a hospital social worker at Concord Hospital until 1990, then moved to Melbourne to take up a position as Deputy Social Work Manager at the Austin Hospital until 1993. From 1993 to 2001 Jo was the manager of the Northern CentreAgainst Sexual Assault in Victoria. She was also involved in a range of statewide and national peak bodies which advocated to eliminate violence against women including being convenor of the Victorian Centres Against Sexual Assault Forum; an inaugural member of the board of the National Association of Services Against Sexual Violence; and a member of the Victorian Community Council Against Violence. Jo was also on management committees of a number of women’s services in Melbourne. From 2001 – 2002 Jo worked for the NSW Health Department as the Senior Policy Analyst for Sexual Assault and Domestic Violence. In early 2003, Jo joined Western Sydney Local Health District, initially as Service Manager of the Child &; Family Team at Mt Druitt Community Health Centre. Since 2004 Jo has held senior management positions within Community Health mostly within Blacktown LGA. In early 2017, Jo was appointed to the position of Program Lead Priority Populations within Western Sydney Local Health District. Jo remains very involved with local non-government agencies and services and has been on the Board of the Women’s Activities and Self-Help House in Mt Druitt since 2006, and on the management committee of Mt Druitt Ethnic Communities Agency since 2007. Jo is also the co-chair of the Mt Druitt Family Violence Response and Support Strategy. Jo has a particular passion for working with the most vulnerable and disenfranchised in our community. She is committed to ensuring that the community receives the best possible service from community health services and from those non-government organisations with which she is involved. Julz has a passion for supporting communities to thrive and believes that if a community is strong, supportive and provides opportunities, then families can focus on supporting their children to dream big and to foster the belief they can do anything they dream. Julz grew up in Western Sydney and has spent 25 years volunteering and working within local communities.Having had her first child at 16, Julz has experienced first-hand the negative impacts of isolation, fear and judgement, and knows what it takes to overcome these. Digging deep to truly believe everyone deserves to reach their full potential, Julz decided nobody was going to stop her from helping to create a community that could provide support and opportunities for her children. At 17, Julz returned to high school to complete her education. During this time the funding for the program Julz was enrolled in had been cut, so the opportunity for Julz to complete her education was at risk. It was then that Julz had her first taste of community work. She organised a fundraising event to ensure her school’s program could continue and with the help of the media coverage of this event, the program survived and was funded for a further 4 years. With her thirst for learning and understanding all aspects of community work now ignited, Julz volunteered and supported many community initiatives. Julz initial understanding was built on experience and a hands-on approach, but she also eventually completed her Diploma of Community Services, Diploma of Counselling and is currently completing her Bachelor Degree in Community Services. In 2006 Julz became the first Child Friendly Officer for Mission Australia’s Communities for Children Program in Mt Druitt. Julz career progressed from there and she is now Mission Australia’s Area Manager in Western Sydney, leading a vibrant team of 60 who each support families and communities across all of Western Sydney. Julz brings experience in the areas of Homelessness, Mental Health, Juvenile Justice and Early Intervention Programs. Julz believes in the WASH House and wants all women to feel safe and confident, for families to raise children in environments free of violence and full of potential, and in communities where they feel they belong, their choices are supported and where there is a fundamental belief that they can do anything they dream. Widad passionately believes in a woman’s right to choose her own destiny and to live in a safe environment for herself and her family, free from violence and discrimination. Widad studied history at university and worked as a community worker in Syria. After arriving in Australia she attended a disability community Awareness Course in 2000 with the WASH House and in 2009 attained an Aged care worker certificate. Widad has particular experience and interest in working with people from diverse cultures, language and social backgrounds. Widad has been on the WASH House Board of Management since 1999 (with a break from 2013 – 2016) and prior to that worked at the WASH as a volunteer with the Tuesday Night Club supporting members of the community with a mild intellectual disability. Helping women is very important and supports strong families and children and provides for healthy future generations. Heather has 20 years’ experience in youth, community, health and local government sectors, particularly in Western Sydney. She has developed a keen focus on place-based disadvantage, social innovation and leadership. Heather identifies as a queer intersectional feminist. Having led the Neighbourhood Renewal Program at Penrith City Council for a decade, Heather has recently moved to Wentworth Community Housing where she leads the Sustainable Communities Division. This includes managing a range of community engagement, policy development, and employment programs. As part of this role Heather and her team founded Neighbourhood Jobs, a social enterprise aiming to smash intergenerational poverty in Western Sydney through employment and trauma informed training for young people experiencing homelessness. Heather manages this innovative for-purpose business. Heather has two young children and lives in the lower Blue Mountains. She grew up in Mt Druitt and the Blue Mountains and feels most at home in the Blacktown and Nepean regions. Qualifications: Heather holds a Bachelor of Social Science with Charles Sturt University (CSU), a Post Graduate Certificate in Local Government Leadership with the University of Technology Sydney (UTS) and is a graduate of Sydney Leadership 2016, an adaptive leadership development program of Social Leadership Australia. Tarsa is an Australian Born Serbian, and a resident of Mount Druitt. She has 2 adult sons aged 34 and 24 years old and 4 grandchildren. Tarsa is multilingual and speaks English and Serbian. Tarsa has been a Justice of the Peace since 2002. Tarsa joined the WASH House Board in 1995 and has held various positions as a Board member over the period. She was honoured to be the Chair when the WASH commemorated 25 years of service in 2007 and again in 2017 for 35 years, celebrating the thousands of women, staff, Management Committee and volunteers that have woven a thread in the fabric of the WASH House. Another highlight was when WASH House were Finalist Premier’s Award for Excellence in Public Service Delivery in 2013. On 26 March 2018 Tarsa achieved a major milestone and completed 40 years of service with FaCS/ Housing. She has felt very privileged to work for Housing and particularly with such dynamic and strong community partners and NGO’s and other Government Departments, local networks, MP’s in the Greater Western Sydney / Mount Druitt area since 1990. Tarsa’s career started in March 1978 with a 6 month traineeship with the Public Service Board (working at Lend Lease House Circular Quay) and was then employed with Housing Commission September 1978. Her current role as Housing NSW Senior Client Service Officer Specialist sees her assisting high needs clients (including those with homelessness, mental health issues, drug and alcohol substance abuse, victims of DV , refugees) to sustain their tenancies, through linking them up with external supports, referral, advocacy and support. Tarsa was a seconded worker for the Domestic Violence Court Assistance Program for 10 years. She has worked on special projects including Probation and Parole/Housing Homelessness Project 2005 - a Crime Prevention Strategy in the 2770 Mount Druitt area which was the recipient of the Australasian Housing Institute Award December 2007 Excellence in Practice: Delivering support solutions. Since 1982 Tarsa has done voluntary work with KSS - Serbian Sister’s Circle in the Serbian Orthodox St Nicholas Church at Blacktown (SSC). This includes preparation of lunches, events to uphold the traditions, cultures and values of the church, as well as visiting aged and frail parishioners in the Community, Nursing Homes and Hospitals. Tarsa’s father (who is 96 years of age) is a founder of Saint Nicholas Church in Blacktown. Since 2008 she has been a member of Saint Nicholas Parish Board holding positions of Treasurer for 3 years, and currently in her fourth year as Secretary. Tarsa is also the Liquor Licensee for Saint Nicholas Orthodox Church Blacktown 2017 to 2021. Saint Nicholas in 2016/2017 was active and supportive on variety of different fronts and supports many families, vital causes and organizations (including PCYC and Ronald McDonald House) through prayers and financial support. Saint Nicholas donated over $8000 to charitable organizations within Australia and overseas in the past year that needed financial support.